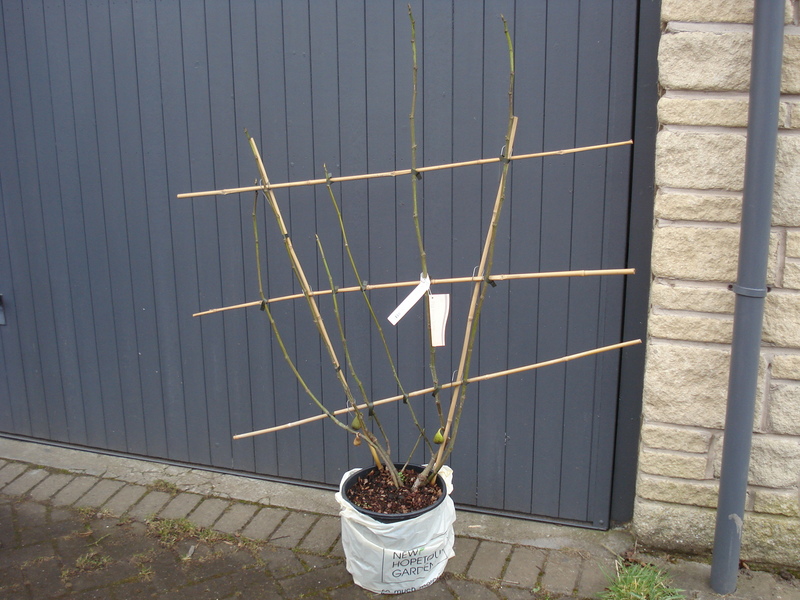 We planted some new trees two years ago; James Grieve, Egremont Russett and another variety, the label of which has long blown away. We expected some fruit this year and while we do have some very tiny apples we are really disappointed in the size of the trees. One of them has tripled in size but the rest remain the same and the trunks still require some support. Our two established apple trees (Bramley and Grenadier – both cooking apples) are rewarding us after the hard pruning they had last year. At the end of last summer a good friend of ours, and fellow cider-maker, was evicted from his allotment. His crime? He dreamed of the old-fashioned allotment experience; the shed as his refuge from the world, sipping ice cold cider from a cool box while he tended his veg, sitting in the sun watching his tatties growing. The reality? Rules and regulations. He let some weeds grow and the committee decided he was undeserving of his sixty square metres and he was promptly evicted. The irony is, he had just purchased two apple trees so he gave them to us. We plonked them in large pots until we could make space for them and this year they are producing more between them than the whole of last year’s harvest. Again we planted two pear trees two years ago, both Conference variety. 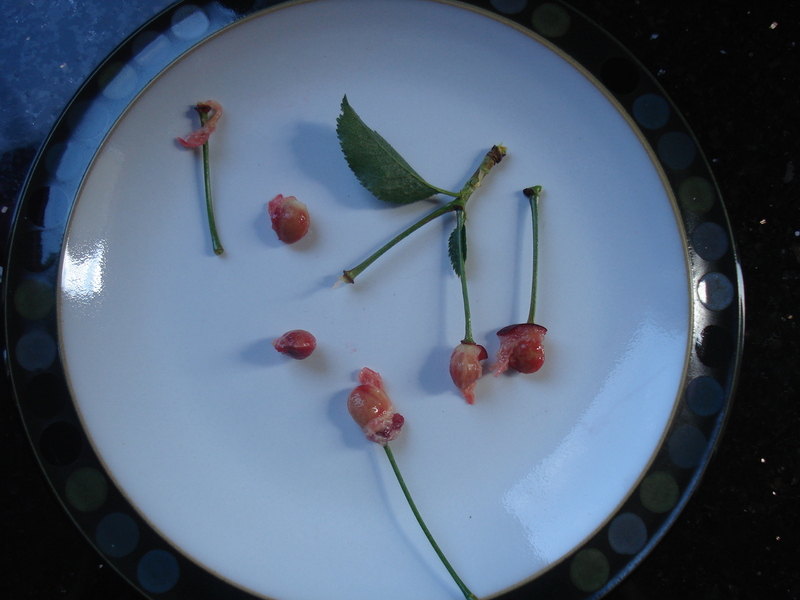 One suffered a very odd leaf condition each spring and this year, despite both having produced blossom, there is no fruit at all. 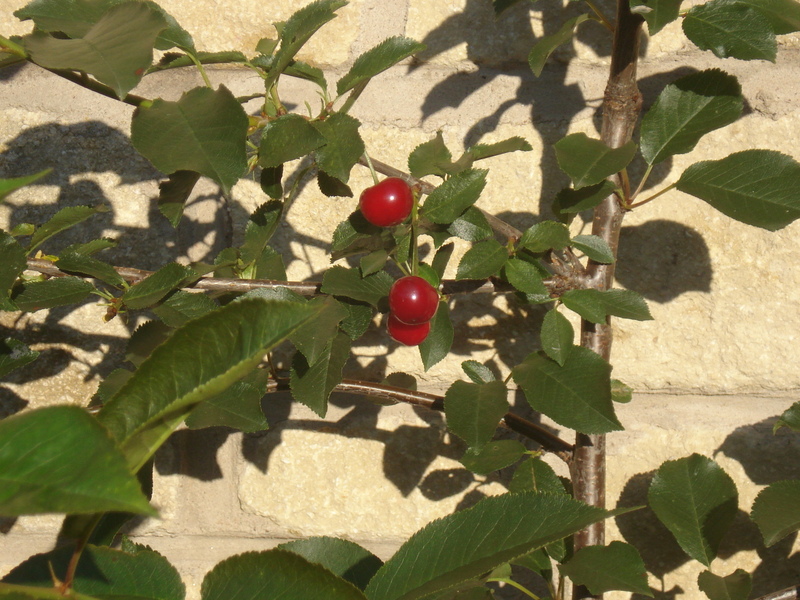 The Victoria Plum tree we planted in 2010 has come into its own this year. It is so laden with fruit that one branch has broken with the weight and Mr Mac has had to fashion a DIY support to stop another branch from snapping. The fruit is just starting to colour so not long now! Mr Mac’s DIY branch support fashioned from wood and carpet! 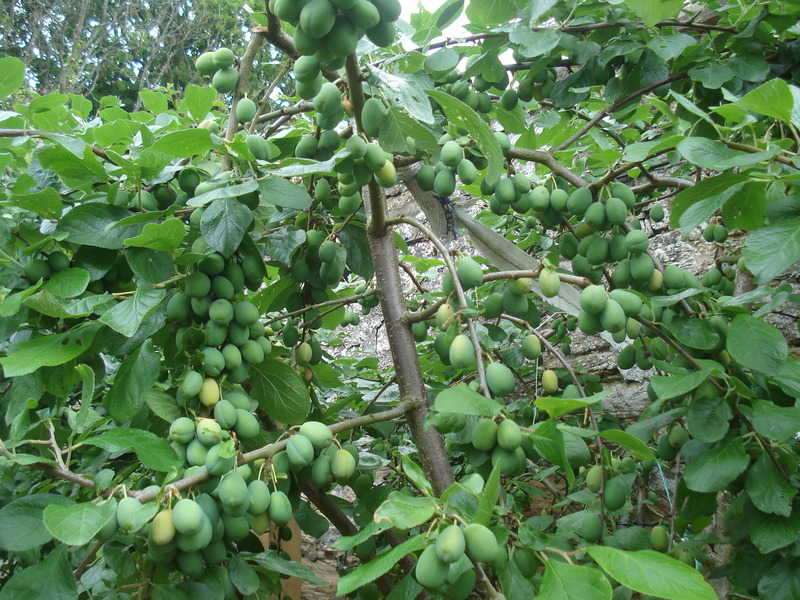 The gage tree we planted beside the plum tree (variety Cambridge) produced four gages in its first year and since then nothing. We had high hopes this year when there was a tiny amount of blossom but there is no fruit at all. 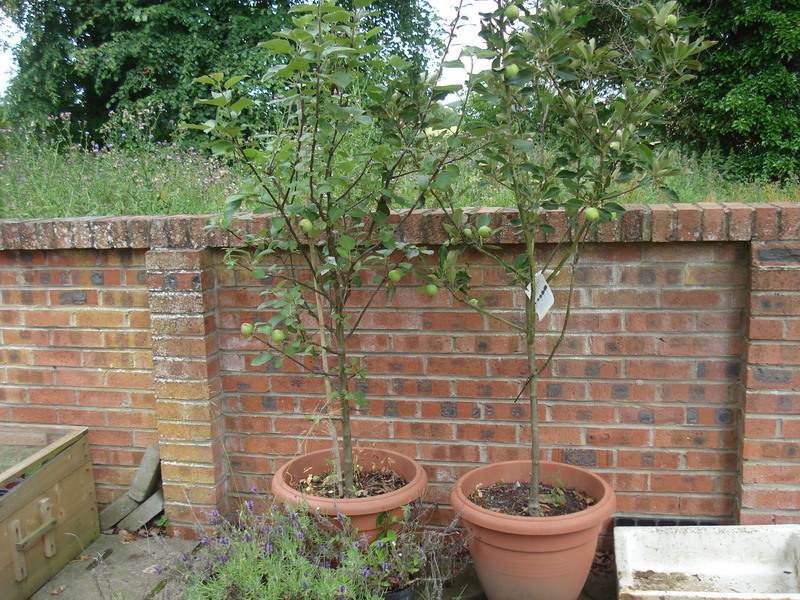 This is my £1 bargain bucket Blueberry Elisabeth plant I rescued in 2011. 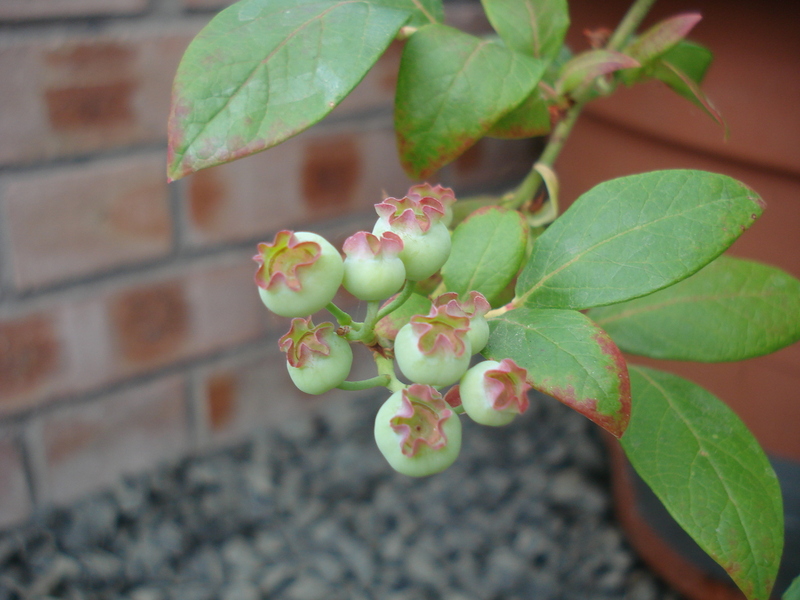 I brought it home and planted it in a pot with some ericatious compost and last year it recovered and produced a few blueberries…..not quite enough for a pot of jam though. Maybe if I had not nibbled on them every time I was in the greenhouse……..This year looks more promising. We originally planted varieties Elsanta, Judibell and Cambridge Favourite but soon realised they were in the wettest part of the garden and strawberries don’t thrive in swamp-like conditions. This year we bought new plants and put them in a raised bed. However, the badger ate them. We rescued some runners from our old plants and while we did harvest a small crop we only managed three small pots of strawberry jam. The rasps have had a great year, even the ones in the swamp that we have not got round to relocating. 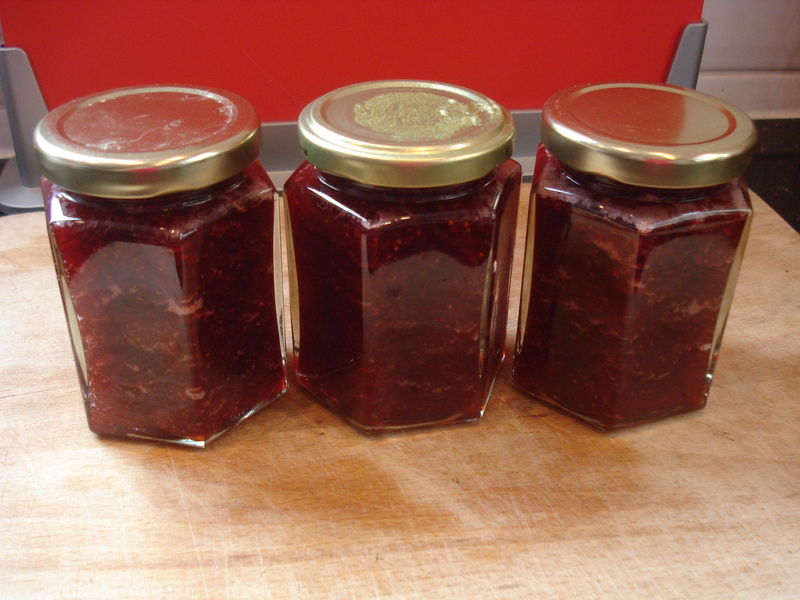 The variety is Glen Clova and so far we have half a chest freezer full, all ready for the jam pot. 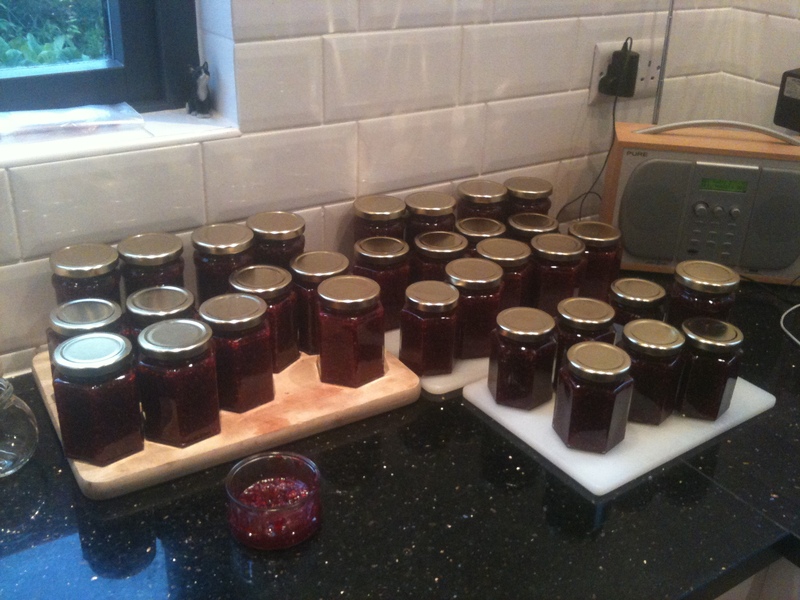 Like the rasps we harvested over 20lbs of blackcurrants and, even having given lots away, have produced 48 pots of jam. The variety is Ben Lomond. 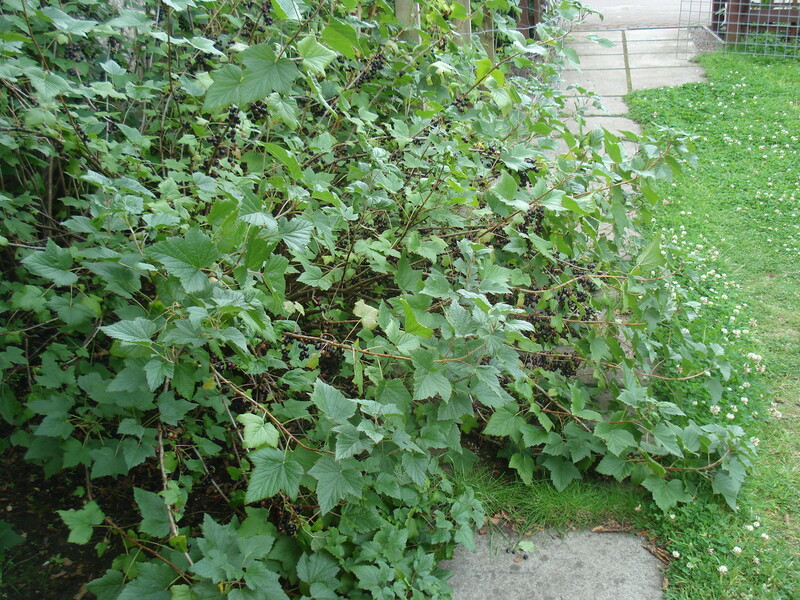 There were so many blackcurrants the bush collapsed on to the path with the weight! 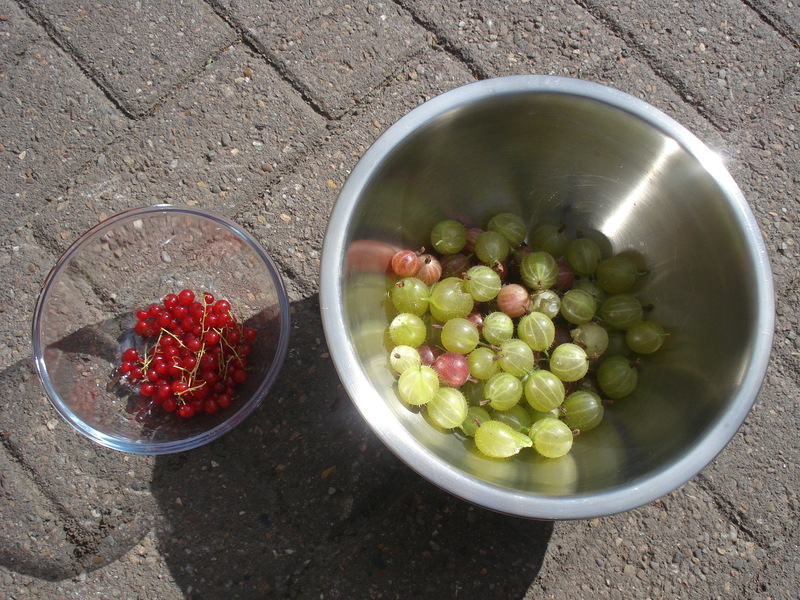 Every year, so far, the red and white gooseberry bushes have produced fruit then literally overnight all the foliage would disappear and the fruit would go mouldy. This year we have been pleasantly surprised that this did not happen and a small amount of fruit was harvested. 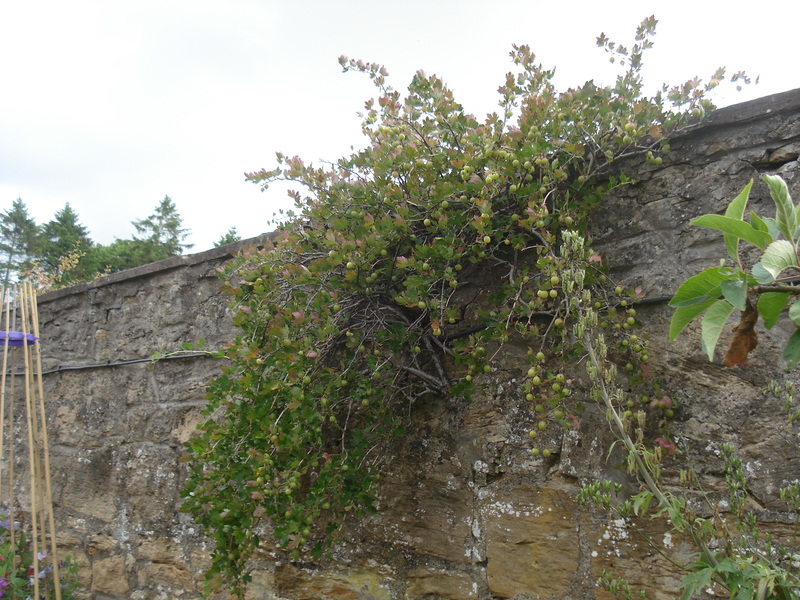 Needless to say the gooseberry bush growing out of the wall is laden with fruit. I think that bush would survive a nuclear holocaust! 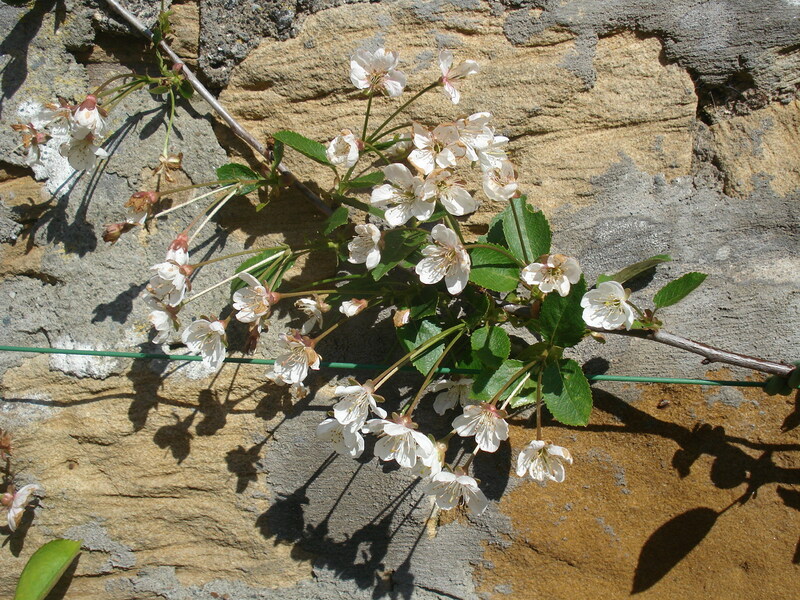 This little bush growing from the wall usually produces about 8lbs of fruit! Beside the gooseberry bushes, the redcurrants usually suffered the same disappearing foliage fate. I am please to say this year I have picked my first redcurrants. However, I was positive I planted a red and a whitecurrant bush but the bush I though was a whitecurrant is actually a blackcurrant. Very odd. So far we have two figs left on the tree. They seem quite happy but value for money they are currently the most expensive figs in the universe at £24 each! I had two plants which were thriving in the greenhouse then they just went brown and keeled over. 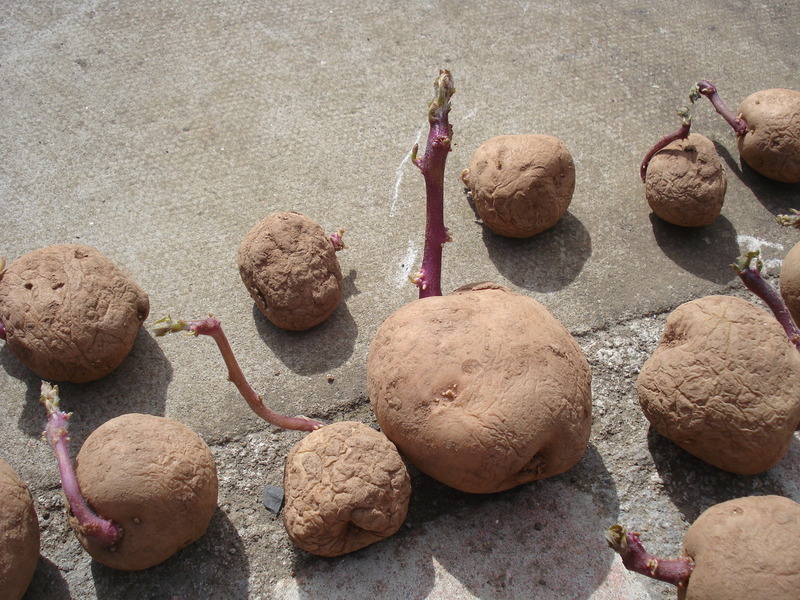 When I pulled them out the roots had virtually disappeared. They were in the sunniest part of the greenhouse and oddly enough I think it was too hot for them during the heatwave! 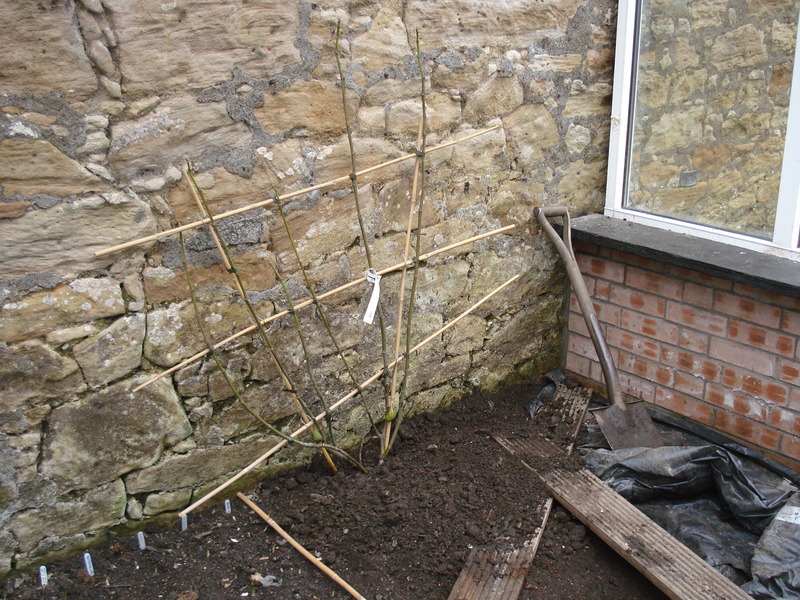 We relocated one of the cherry trees to the back wall of the summerhouse which is north facing. All this has done is provide a haven for the birds to eat the cherries undisturbed! 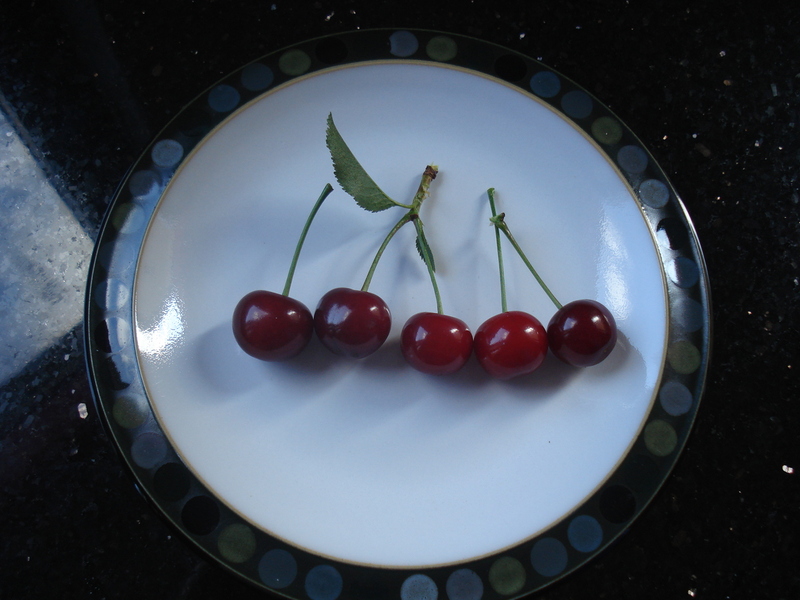 Last year we had 5 cherries, this year it looks as if we may be left with 7! Still no cherry pie or cherry jam boo hoo. It’s been a busy old weekend…. While Mr Mac was busy digging, splitting and relocating irises and crocosmia earlier this week I was in need of something to make me look “busy” so I did not have to help him. 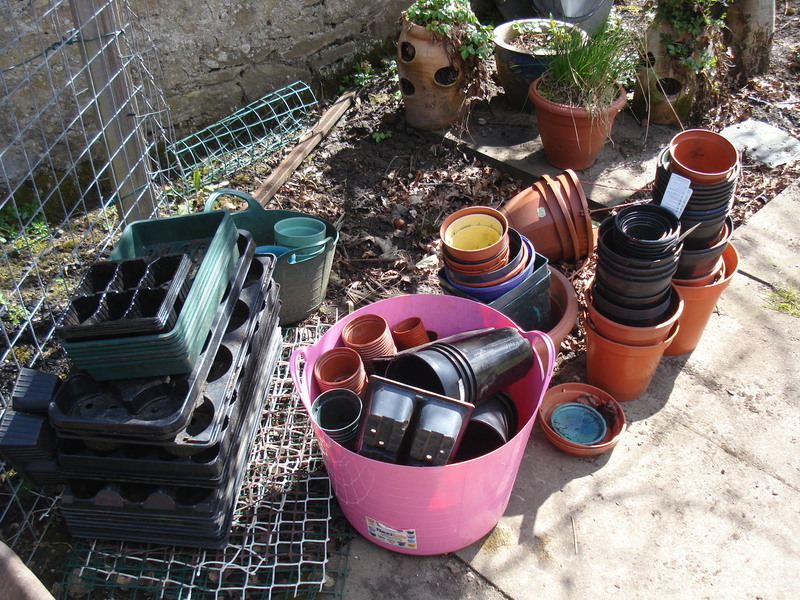 To give you an idea of how much I really did not want to help him I decided to tackle my pot mountain……the pile of used pots accumulated over the summer of 2012 that had formed a heap where they had been thrown out of the greenhouse when their purpose had been served. I think I even mentioned in my Jobs for February blog that it was the prefect time to wash and clean pots yet here we are at the end of April and mine were still untouched, caked in soil, providing the slugs with a comfy winter hotel. I was so desperate not to wash the pots that I had even offered to pay some of my friends children to do it for pocket money during the Easter holidays but apparently the youth of today don’t need money! I set about sorting through the pile, throwing away broken pots, trays and modules that were beyond saving and ended up with a nice, neat, tidy pile. 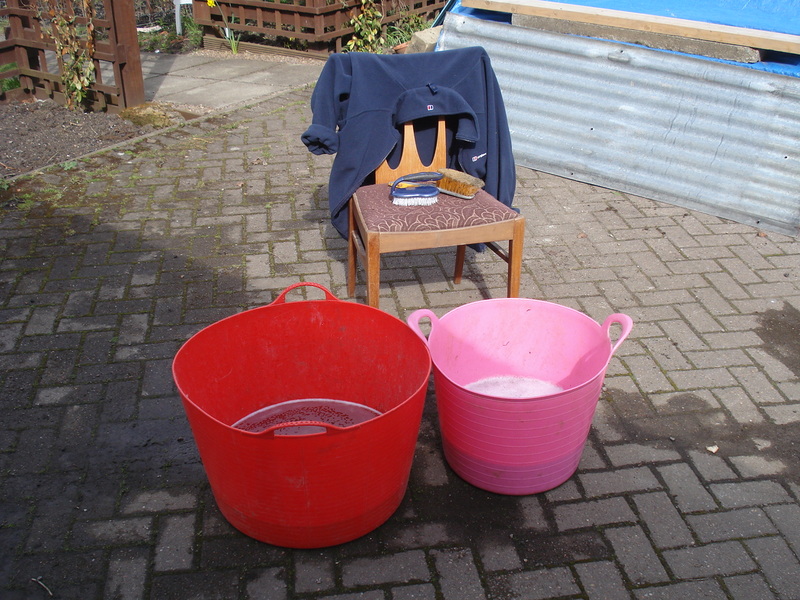 So yesterday when the sun was shining I got my chair, my scrubbing brush, a tub of warm water with some washing up liquid and bleach in it and another tub with clean water for rinsing….and set about scrubbing. All ready to get scrubbing! 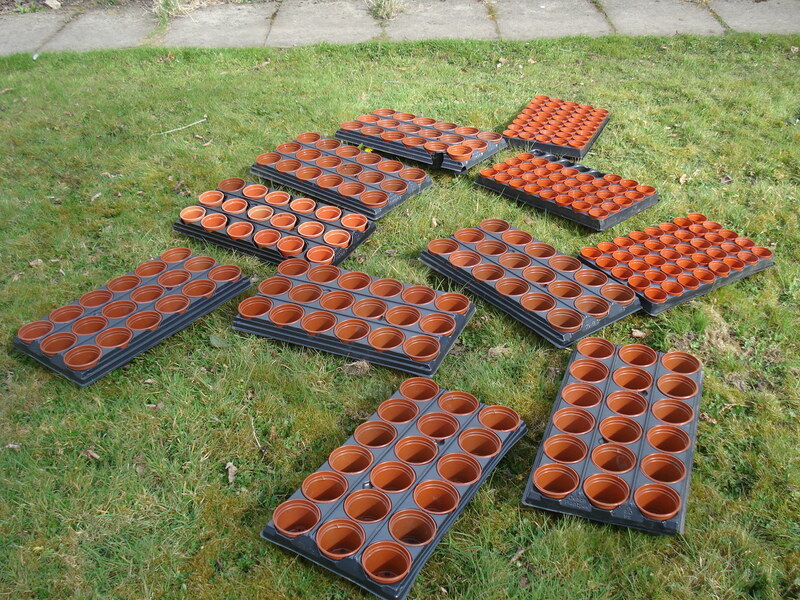 I did not get them all done, but the smaller pots I need for potting on seedlings are all clean and ready for use. 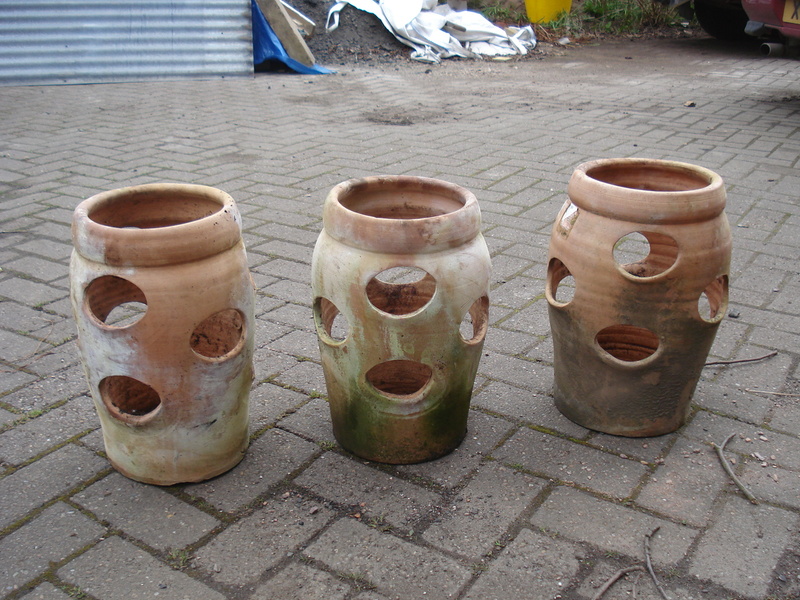 The larger pots can wait for the next sunny weekend! 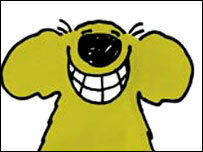 On Friday I had a delivery of “Million Bells” plugs that I had ordered for my hanging baskets. I read an article recently about planting plugs directly into pots and baskets if that is where they will ultimately end up, so as these were all destined for hanging baskets I decided to plant them up. There were six each of lemon, fire crackle, blue, deep pink and white so I planted the four small baskets with the lemon and fire crackle and the two large baskets with pink, white and blue. 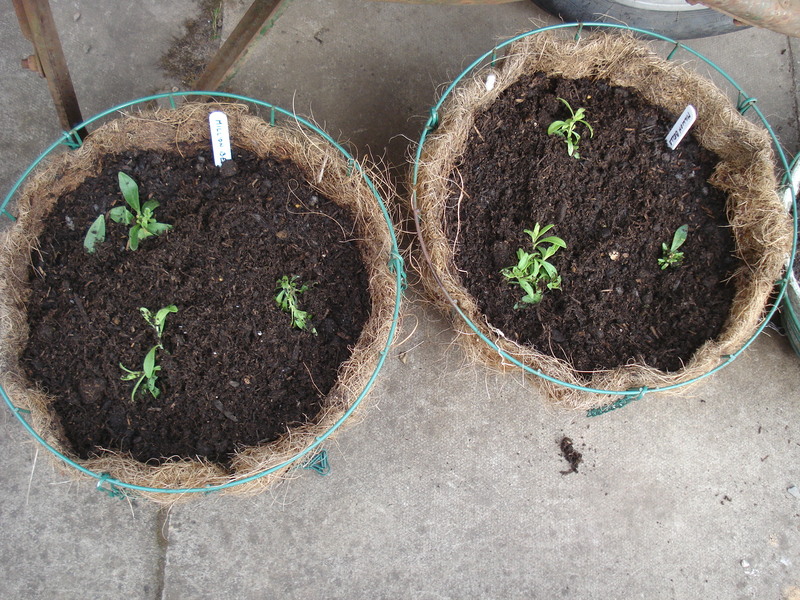 The instructions recommended three plants per 30cm basket so while they look slightly puny at the moment hopefully they will soon fill out. I will keep them in the greenhouse for a couple of weeks and then start hardening them off with a view to putting them out by the end of May. Today the forecast was for rain but we were fortunate enough to have gorgeous sunshine between showers and so we got the potatoes planted. 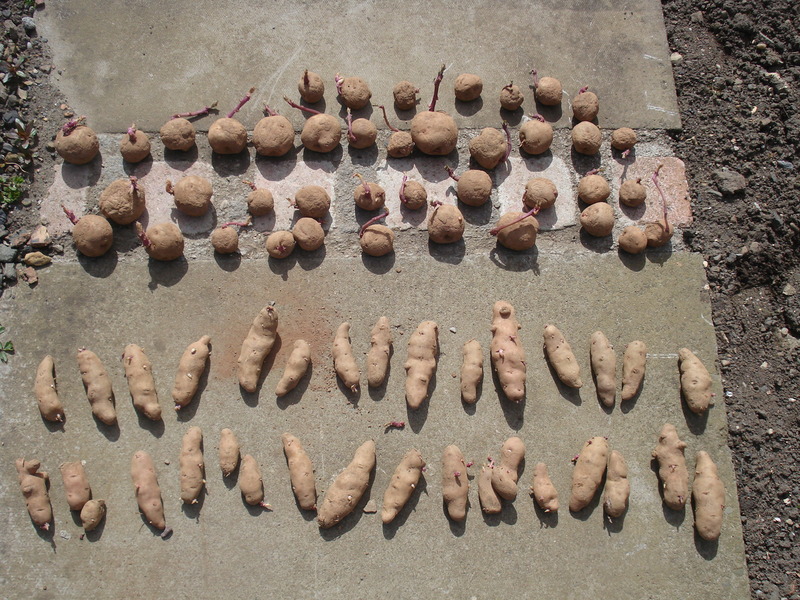 We planted Maris Piper and Pink Fir Apple varieties and this year we have decided to try growing them in the ground rather than tubs or bags (except the first earlies). 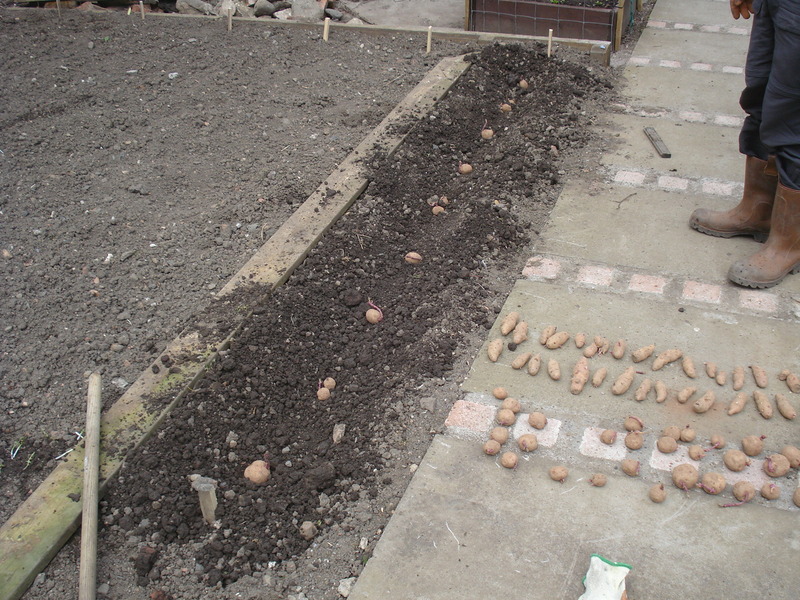 We have been watching Gardeners’ World and Beechgrove Garden on BBC and so did exactly what they did….dig a trench, plant the seed potatoes 12 inches apart and pull the soil up over the top to form a ridge. There has been a lot of talk about the soil being warm enough to plant main crop potatoes but we did not check the temperature and just planted them anyway. Other than the obvious way of checking soil temperature I heard of another method recently and that is to scrape back some soil and stick your elbow in as if you were checking bath water for a baby. Apparently in Victorian kitchen gardens the way they checked if the soil was warm enough was to pull down your trousers and sit on it with your bare bum! Thank goodness for soil thermometers! Even though the seeds have been in the dark garage rather than on a sunny windowsill, they still have chits! We set the seeds out in the trench but then dug a hole to put them in so they were even deeper. All haunched up and ready to grow! Finally we decided to make the most of the sunshine and planted the garlic (Solent Wight) and the rest of the strawberry runners. 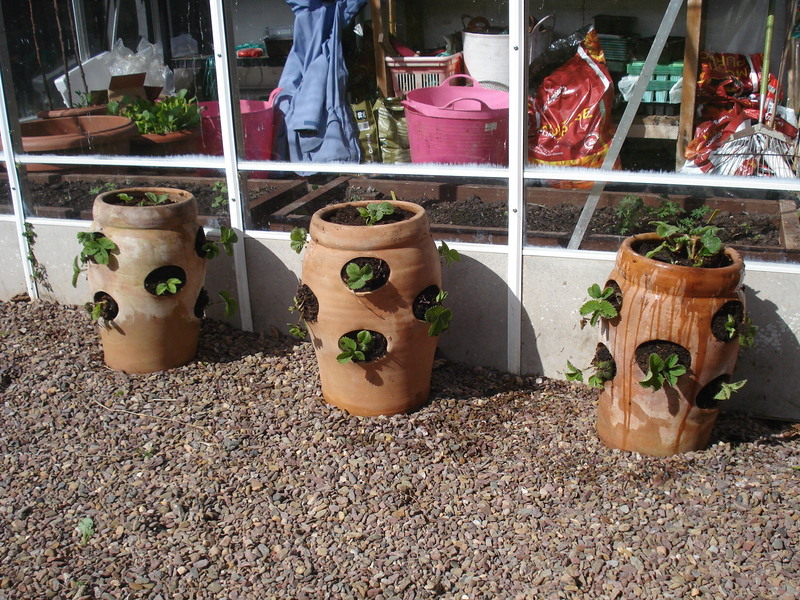 We forgot we had some old strawberry pots (yes they were lying under my dirty pot mountain where we could not see them) and so they were given a quick scrub to remove the algae and planted up with the runners from the old strawberry patch. 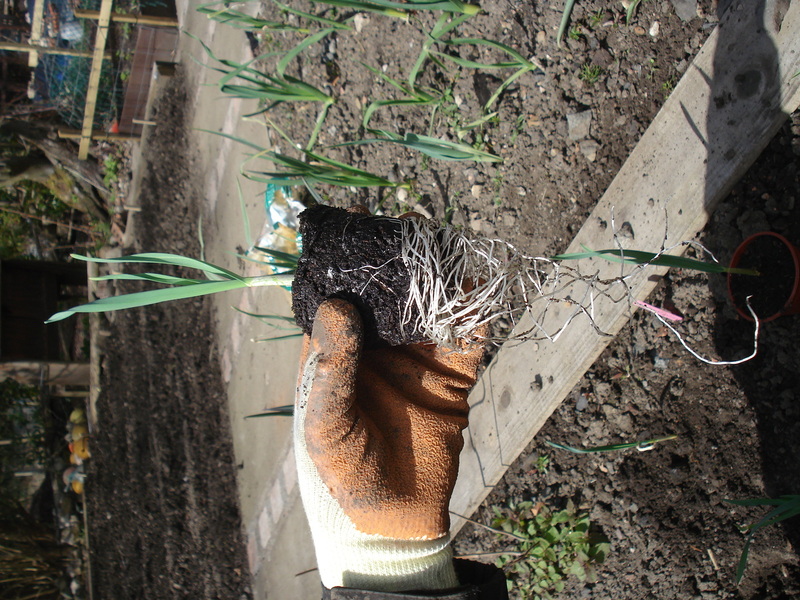 The garlic had been hardened off for weeks but we could not get over the length of the roots. We sneaked the garlic in beside the leeks. One of the first things we planted when we moved to this house was strawberries. We found a quiet patch at the bottom of the garden and planted Elsanta, Cambridge Favourite and Judibell – early, main and late croppers. However, we soon discovered that the quiet patch is also a very wet, soggy, waterlogged patch and while we had a reasonable crop in the first year, there has not been enough for a pot of jam since! 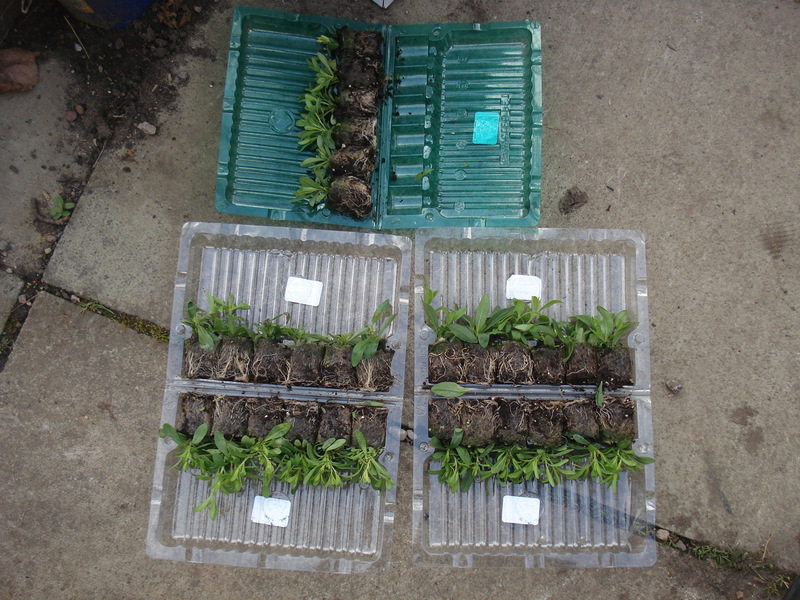 We decided to move them but as the plants were coming to the end of their producing life (they should be replaced every three to four years) we simply tried to catch as many runners as we could to supplement new plants. So last weekend we dug up the runners. There were quite a few but none that looked particularly healthy so Mr Mac went off to the shop and bought 18 new plants. 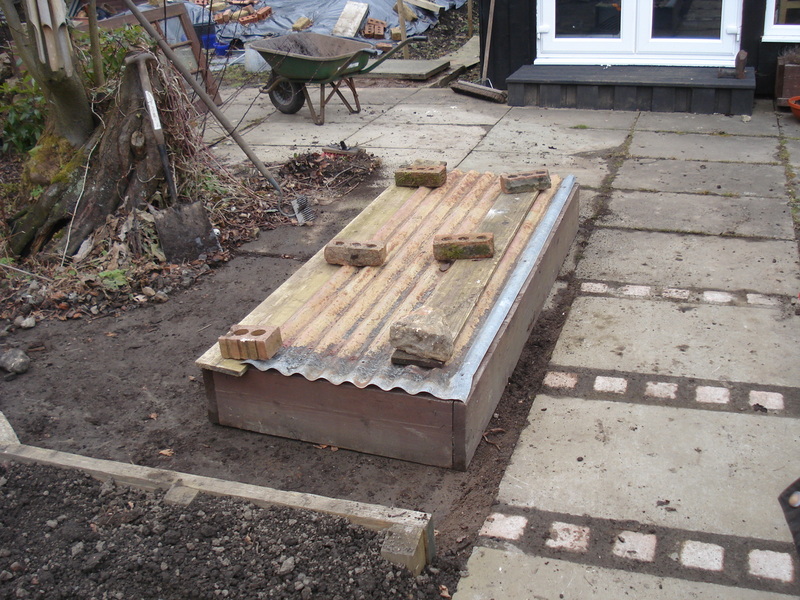 We had an old cold frame which had been made from our old front door and some lengths of wood. 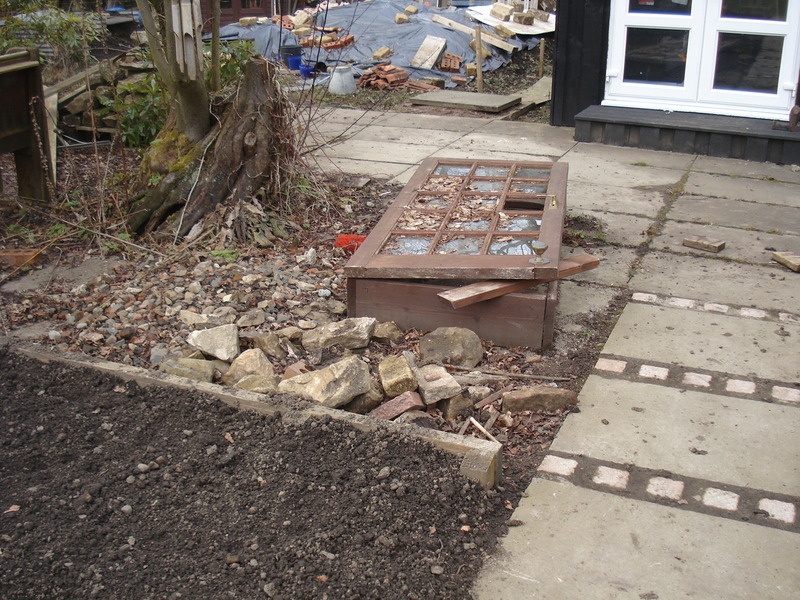 Some of the glass had smashed and it was lying empty so we decided to take the door off and tidy the surrounding area. 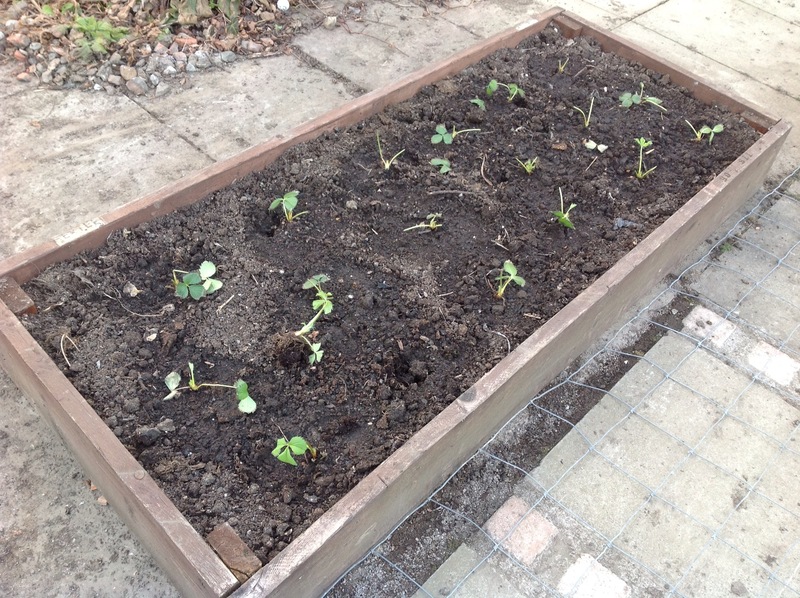 The old cold frame which was to become the new strawberry patch. 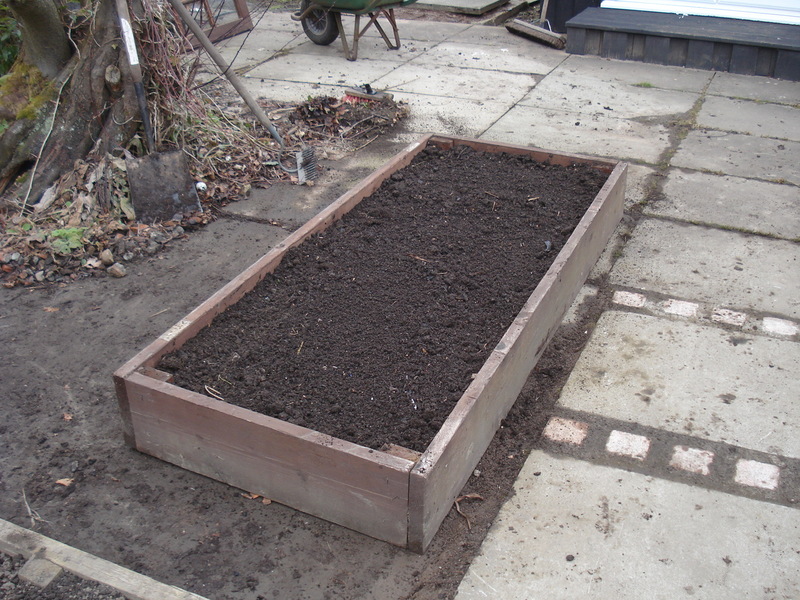 and covered it to warm up the soil. At the weekend we planted the new plants. All Elsanta variety as we found these to be the best, we will get some straw from Rob the horse next door to sit them on and Mr Mac planned to craft a cover to protect them from birds. However, it was too late. Look what happened! Something has been getting into the garden, scratching up the grass and eating the tulips. They also have a taste for strawberry plants! It just seems to be the leaves that they have eaten and the centres and roots seem to be ok. We were not sure whether it was deer, squirrels, pheasant or pigeons. But yesterday morning Mr Badger was seen leaving our garden in the early hours. So Mr Mac has created a protective cover! Fingers crossed they will recover. Choose a sunny sheltered spot with fertile, well-drained soil with plenty of well-rotted organic matter worked in. Plant them 18 inches apart or in a raised bed with deep, rich soil they can be planted 12-15 inches apart. Once the fruits form spread straw or synthetic strawberry mats between the plants to protect the fruit from dirt, damp and mud splashes. Protect the fruit from birds. Plants crop well for 3-4 years after which they are best replaced with new young plants in a new location. 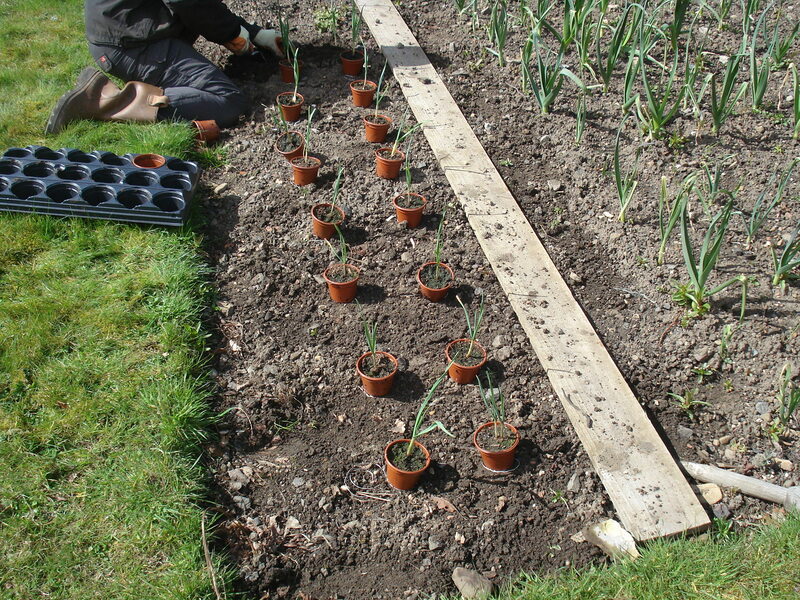 Try raising new plants from runners – the stems produced by the plant to regenerate itself. 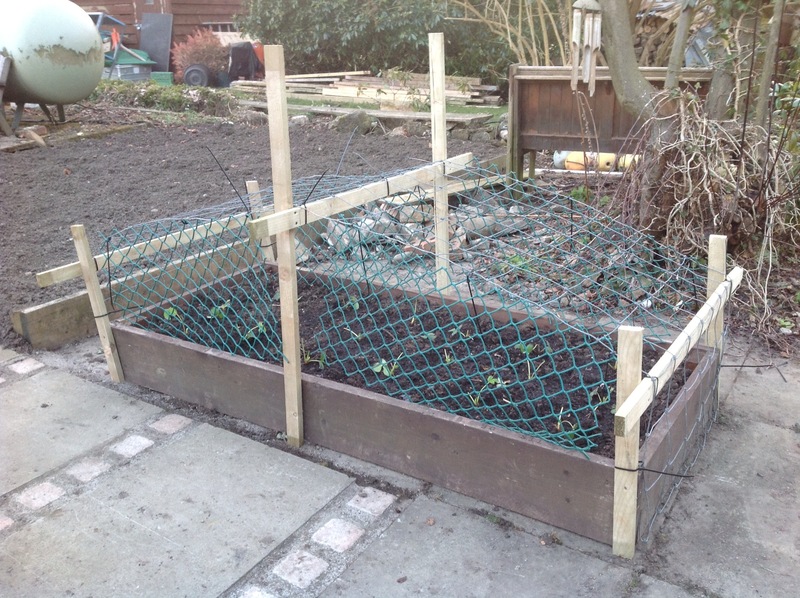 Peg down the runners into pots of seed compost. 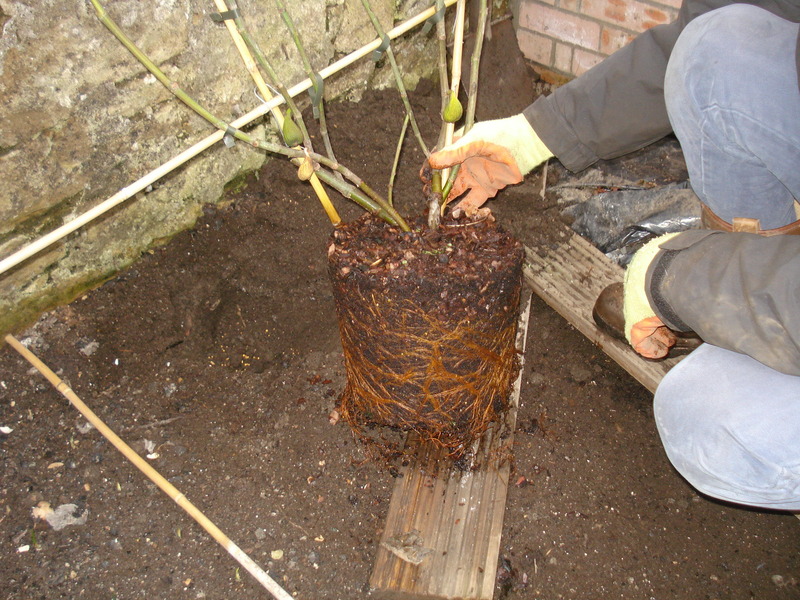 Once the runners have rooted snip the “umbilical cord” connecting them to the parent plant and grow them on in a cold frame until they are ready to plant. Ficus carica…..or figs to you and me! When we built the conservatory greenhouse, Mr Mac wanted to plant some form of permanent fruit tree inside it that would be able to grow up the wall. He wanted something unusual that would not grow outside but would thrive in the Mediterranean type climate created inside. For a year now we have hummed and hawed about what would be best, the three main contenders being grapes, peaches and figs. We ruled out peaches because our next door neighbour has a peach tree in his greenhouse and we can always snaffle some of his peaches when he is out playing golf or on a golfing holiday (John likes golf…..can you tell?). So it was down to grapes and figs and another winter of procrastination. Mr Mac and I are not quick at making decisions. However, when we were on holiday in Italy last year we discovered just how fantastic fresh figs picked from a tree could be and so the decision was made….a fig tree would be purchased. A few weeks ago I started to do some research. 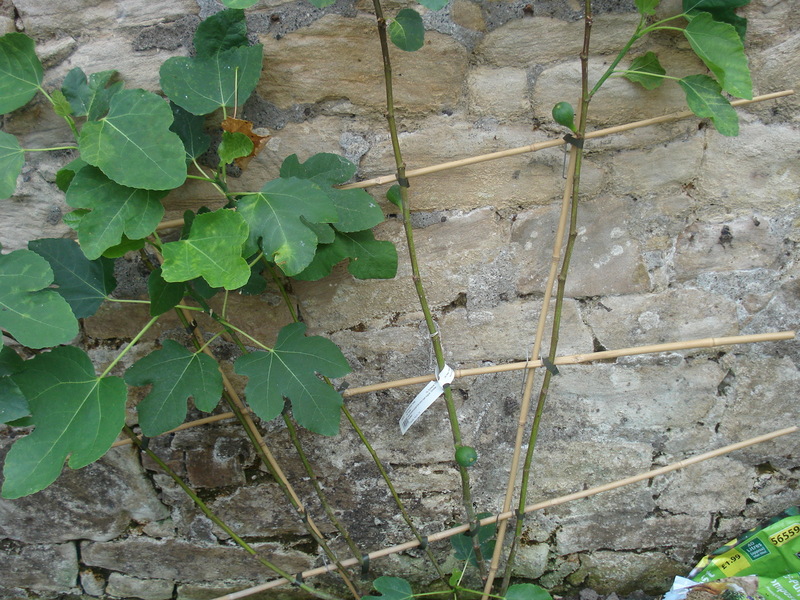 It appears that there are two types of fig which will do well in the UK climate. 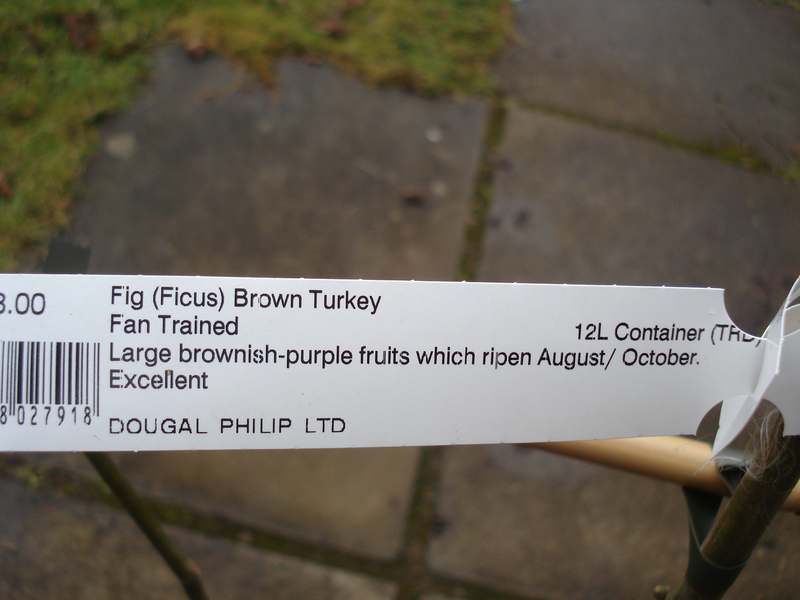 The one we decided to purchase was Brown Turkey, being heralded as the most reliable fig for the UK climate which produces a heavy crop of purple-brown fruits from late August to mid-September…perfect! Thinking we would have to order it online can you imagine our delight when a chance remark at the garden centre led us to being shown two specimens of Brown Turkey and a deal was done. 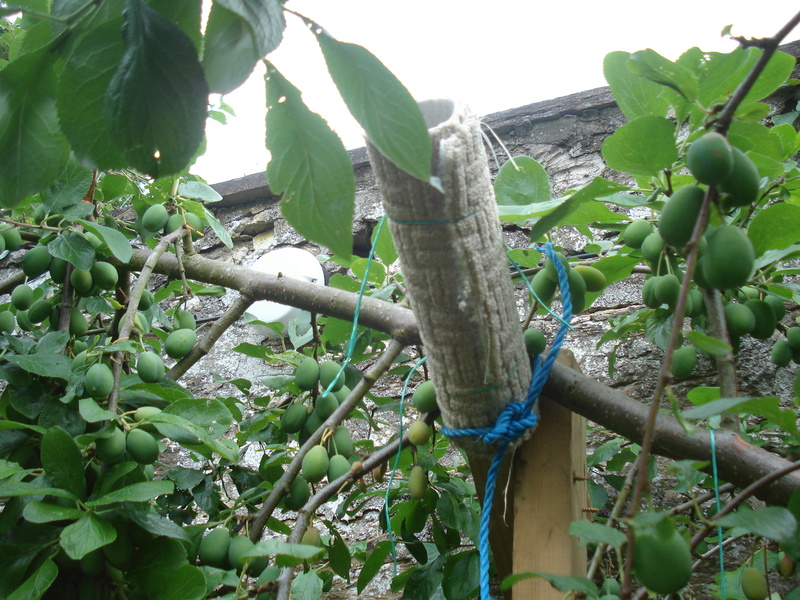 We chose the more established plant which was also fan trained, exactly what we needed for training it up the wall and it had two shrivelled up figs….proof that it had a track record of producing fruit. Planting it was easy, we just watered it well, dug a hole to accommodate it, added some compost and fertiliser and popped it in. So far so good. Mr Mac has also done his sums and on the basis that Sainsbury’s sell figs at £1.99 for three, he has calculated that once we have had 60 figs from our tree it will have paid for itself! Hopefully it should not require much maintenance, simply a spring feed, mulch and regular watering throughout the growing season. I read a lot about needing to restrict root growth to make sure it fruits well rather than growing large and leafy. It is recommended to plant it in a container or line the planting hole with bricks, rubble or concrete slabs. 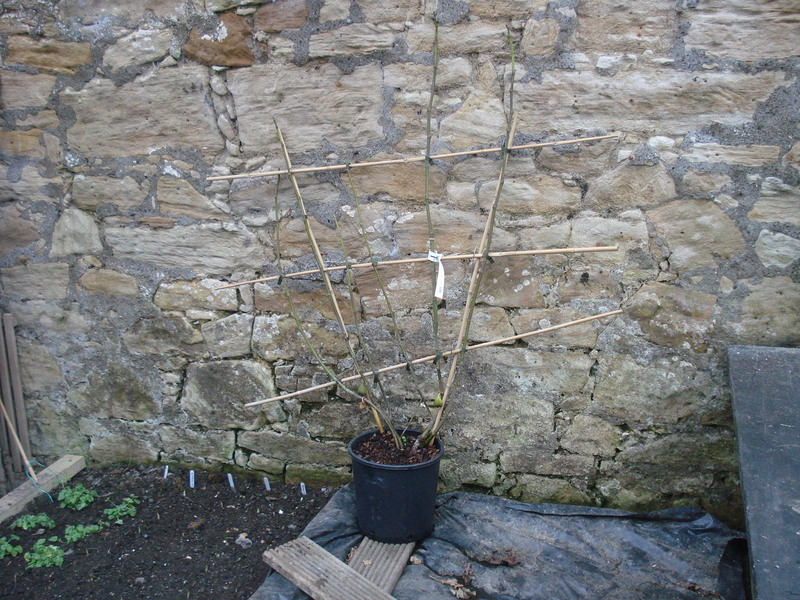 The alternative is to train it it on a wall and prune it to fit the required space….this is our plan so fingers crossed! The helpful lady at the garden centre also suggested that in order to help the fruits ripen, put a heater in the greenhouse. Watch this space. 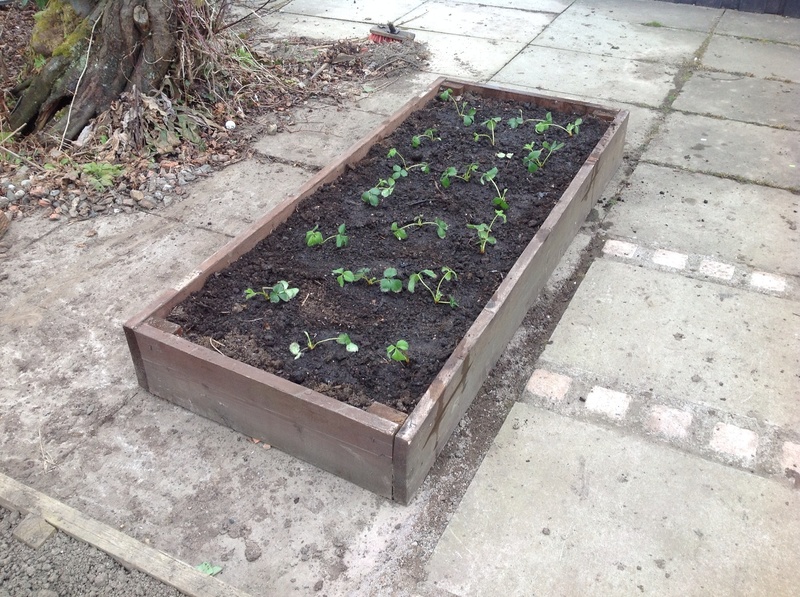 Well we managed to get two jobs done this weekend – rhubarb crowns and garlic planted. 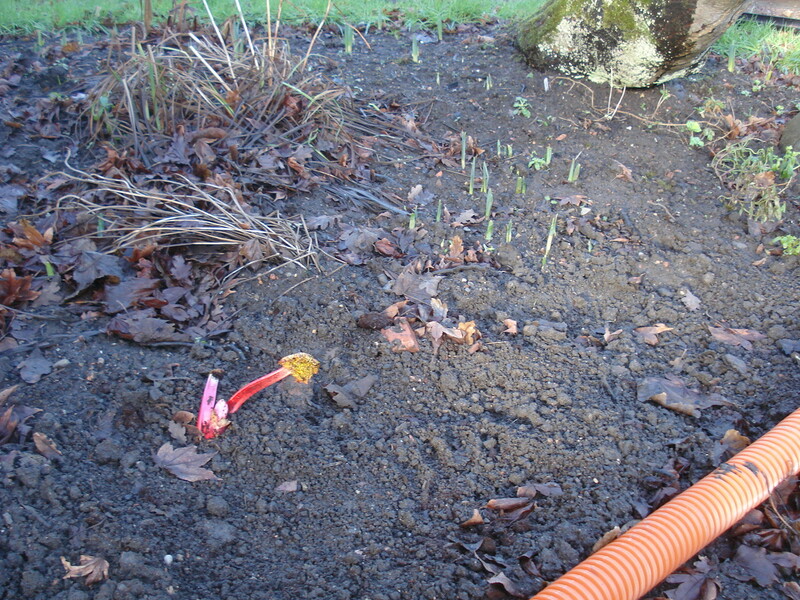 We had rhubarb in the garden but it had been there for at least 20 years. It had stopped producing anything worth trying to eat and after moving it to a new position last year it seemed to have given up. I have since discovered that plants should be replaced after ten years which probably explains it! We decided to start again and bought two crowns each of “Victoria” and “Red Champagne”. We went for these varieties purely because that was all the garden centre had! “Victoria” promises to be high yielding with a tangy flavour (not sour) and “Red Champagne” is an easy to grow sweet tasting variety. According to the labels, rhubarb requires rich soil including plenty of well rotted compost / manure if available. 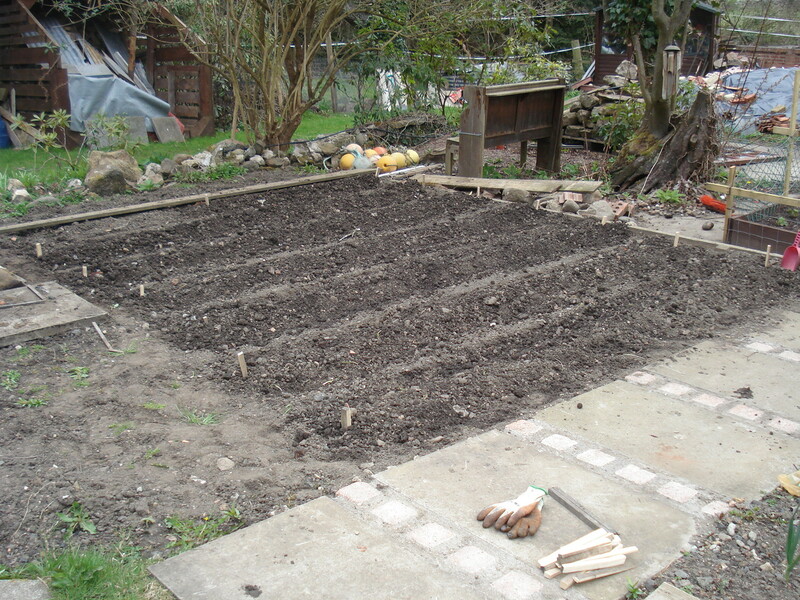 Dig over the area with a fork and plant the crown so the top is just level with the surface. So we did! 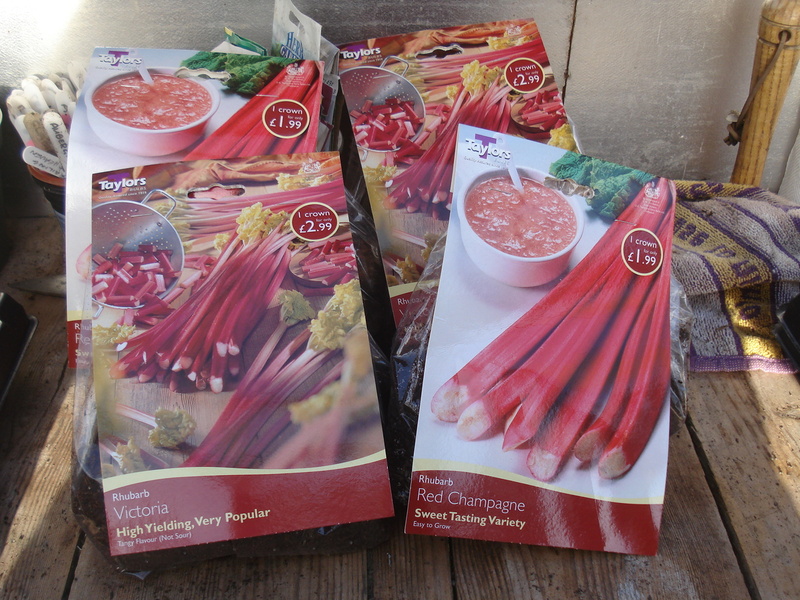 If we are to believe what is written about rhubarb then that should pretty much be all we have to do other than remove flowering stems in the summer, dead leaves in the autumn and cover it with some manure for the winter. A couple of years ago Mr Mac tried forcing the rhubarb we had by using a section of drainage pipe with a brick over the top. 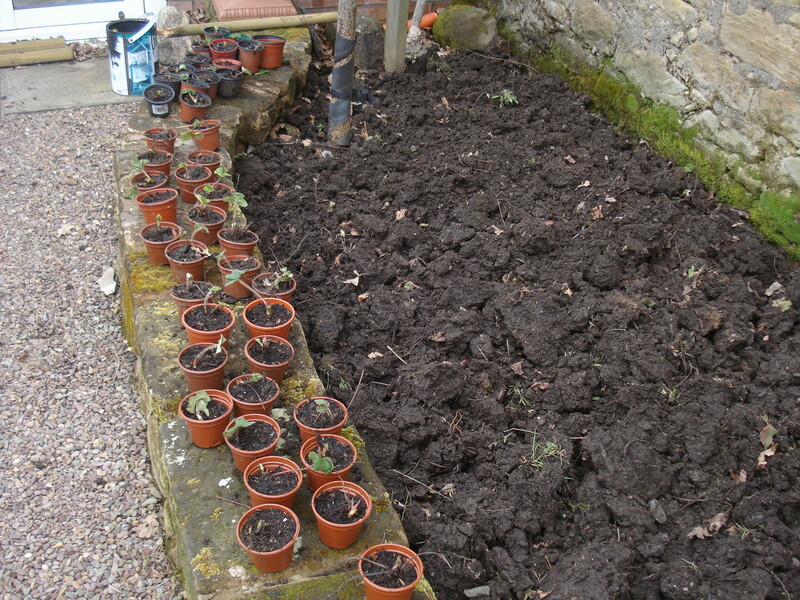 However, with these new plants we need to let them establish for a couple of years before forcing them. Rhubarb growers in the Yorkshire Rhubarb Triangle – between Leeds, Bradford and Wakefield – have applied to the EU for Protected Designation of Origin (PDO). If successful, Yorkshire indoor rhubarb would join a prestigious list that includes Parma ham, Normandy Camembert and Newcastle Brown Ale. Yorkshire indoor rhubarb is produced from crowns that are cultivated outside for two years before being moved indoors and grown in the dark in special sheds and harvested by candle light! Rhubarb was brought to Europe by Marco Polo and was used as a medicinal product for centuries to treat stomach, lung and liver complaints before it made its crumble debut. Rhubarb leaves should NOT be eaten but they contain poisonous oxalic acid which is said to kill off club root fungus, the scourge of the brassica crop. It was the active ingredient in now withdrawn club root chemical controls. 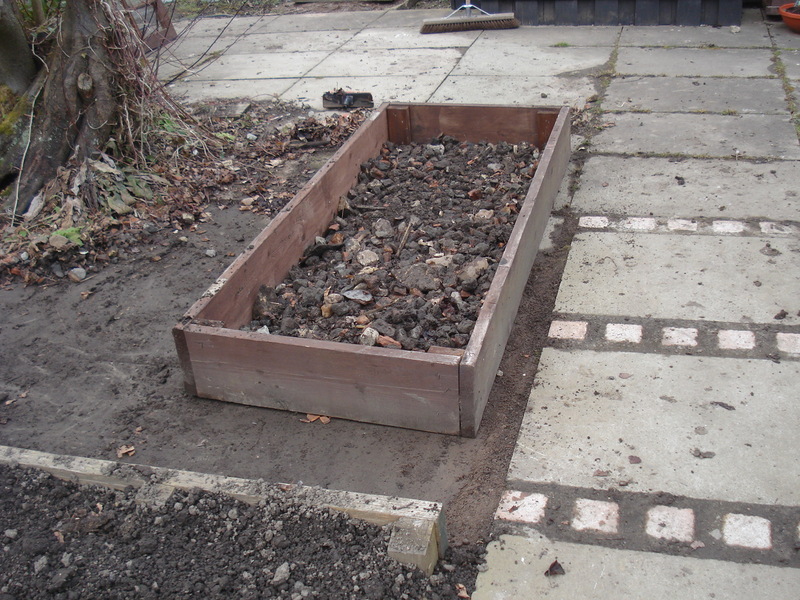 Tear a leaf into small pieces and add one to the bottom of each planting hole before planting brassicas. Rhubarb’s high calcium content has made it a popular metabolism booster among slimmers. I’m looking forward to my first rhubarb crumble. 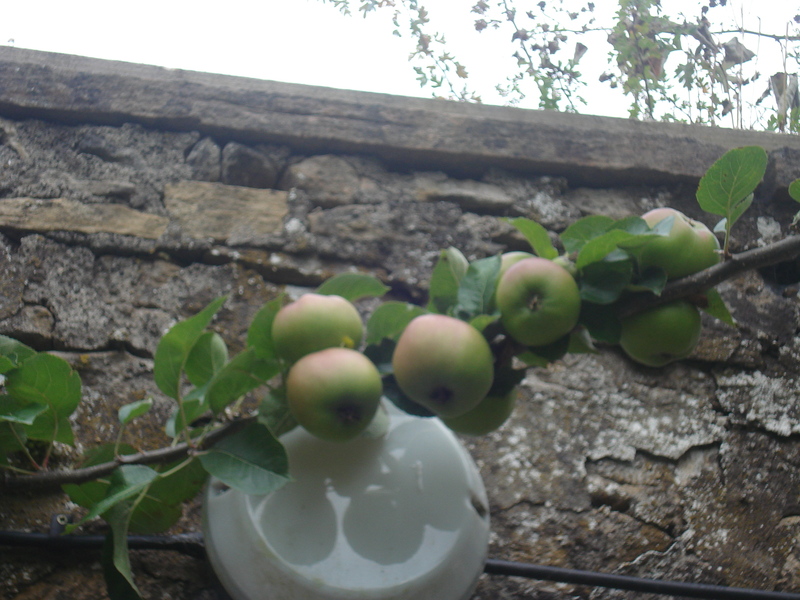 This summer’s soggy weather obviously suited the soft fruit because we have had bumper yields. Over the last few weeks Mr Mac collected and froze almost 15lbs of raspberries. After our third batch of making plain old raspberry jam I decided we should try something different. I remembered tasting raspberry and amaretto jam somewhere…I think it was at a craft fair or farmers market…and so we decided to use the last of the raspberries to experiment. The result is delicious. Put the oven on to a medium heat and sterilise the jars and warm the sugar. Put the raspberries in the pan and warm through until they start to melt (if frozen) and the juice comes out. Pour in the sugar and stir until all the sugar has dissolved. Turn the heat up until you have a rolling boil and leave like this for 10 minutes being careful not to let it boil over the top of the pot (it takes weeks to clean the hob!). Pour some of the mixture onto a cold plate and leave to cool. If the mixture starts to “crinkle” when pushed it has reached setting point. If not boil again for 5 minutes and repeat the set test. Add a knob of butter to clarify and remove any scum from the top of the jam. Add the amaretto and almond essence, mix through and pour into hot jars. Seal the lids tightly and leave to cool before labelling. 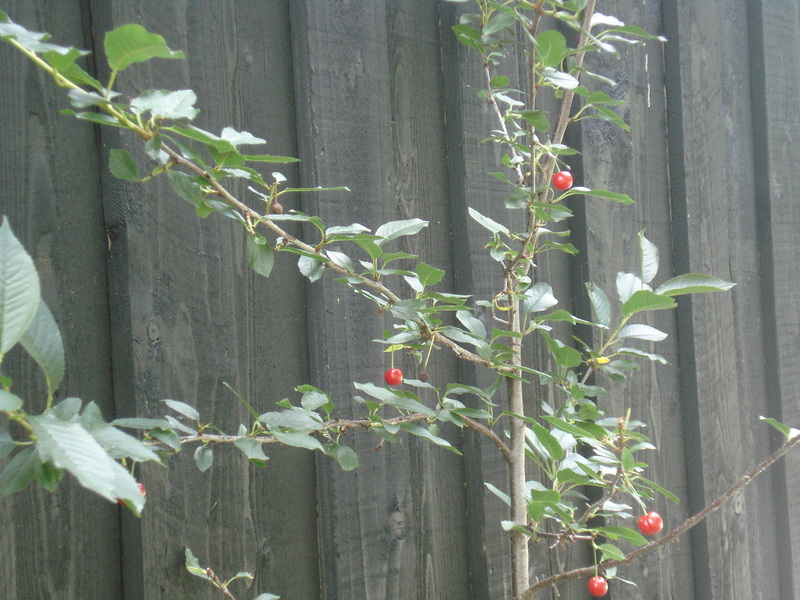 We planted two morello cherry trees last year and had hoped to make cherry jam and cherry pies. After a promising start we had loads of blossom. Never mind, there’s always next year! Help! I seem to have a UFO! Mr Mac hits the rocks!